Room 41 of the British Museum has been closed for a long spell whilst it was redecorated and a new permanent display brought in. 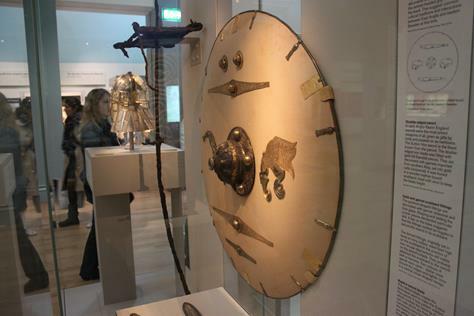 The now reopened gallery houses what is surely the finest collection of Anglo-Saxon artifacts anywhere as well as the most prestigious items from the famous Sutton Hoo burial of King Redwald of East Anglia. Last week I was at the London Book fair but took the opportunity to visit and take some images. Pride of place goes to this helmet. 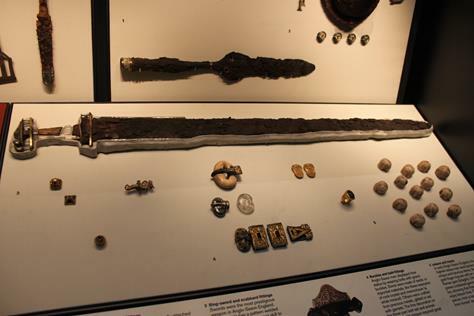 It belonged to King Redwald and was buried with him around 626 AD. 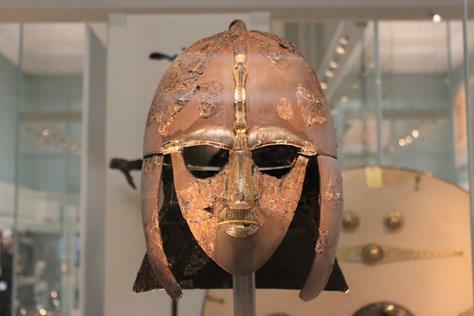 It is one of only 4 helmets that survive from the Anglo-Saxon period – a reminder that what we know of these people is based often on limited records or finds. 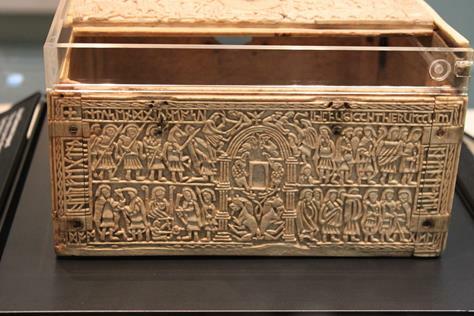 The Franks Casket was made around AD 700 in Northumbria. It contains scenes in which the fairly new Christian Faith and the older Pagan tradition were side by side -as the people tried to maintain the best of both worlds. It also shows many runes and is one of the examples of evidence we can turn to to show what the Early Anglo-Saxons believed and how they wrote. Along side these magnificent artifacts are more mundane but sometimes more striking pieces. Examples of grave goods are show. 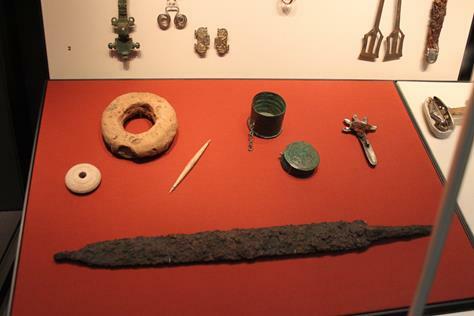 This cabinet shows typical artifacts found in female graves. Examples include bone or clay weaving equipment like loom weights and whorls and iron batterns. Also shown is a needle box. Male graves might contain weapons, buckles from belts, game pieces and sometimes money. In the graves of men and women we might find items used to keep clean and groomed. 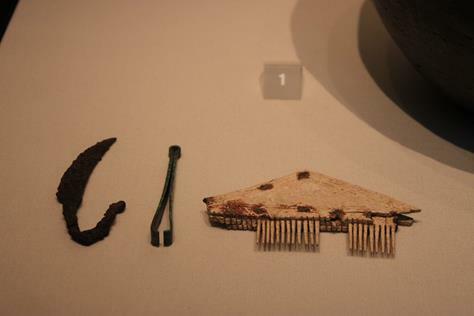 Here is a razor, tweezers and bone comb. For anyone interested in history this reopened hall is worth a visit but for those of us with a more specific interest in the period there are many items here worthy of study. As an Englishman I don’t regard them as ‘these people’, as though they have no connection to us. They are our early Englisc (original spelling, though pronounced the same) ancestors. The English existed long before 1066, and we are still here now – their descendants – despite the politically motivated DNA nonsense that is designed to write the English out of their own history. It is remarkable – when I do talks at schools for example – that much emphasis is given on the Romans, Vikings, Normans etc an not much on the Saxons. Each wave of immigration (and we are as a nation pretty much all immigrants) is important but the race that gave us our language and shaped our landscape etc needs to be remembered. What were ships like in 6th and 7th Century Britain?